FERGUSON, DONALD, farmer, office holder, jp, and politician; b. 7 March 1839 in Marshfield, P.E.I., son of John Ferguson and Isabella Stewart, both natives of Scotland; m. 26 March 1873 Elizabeth Jane Scott in Charlottetown, and they had three sons and two daughters; d. 4 Sept. 1909 in Marshfield. When Ferguson was in his 20s, he began engaging in public debate. An ardent advocate of confederation, in 1866 he wrote a series of letters to the Islander promoting the concept and attacking the arguments of the anti-confederates [see Cornelius Howatt*]. On the land question [see George Coles*] he was a consistent supporter of the tenants and favoured legislation to end the regime of the absentee landlords. He was also a vigorous proponent of an Island railway, and moved a resolution in its support at a meeting of Queens County residents in Charlottetown in 1871. When Prince Edward Island became a province two years later [see James Colledge Pope*], entry into political life came almost naturally for the articulate and well-known Marshfield farmer. 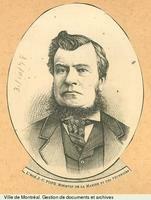 Ferguson had been introduced to public life in 1872 when he was made a justice of the peace. The following year he was appointed collector of inland revenue in Charlottetown. A Conservative in politics, he resigned both positions later in 1873 to contest, unsuccessfully, the by-election for the Legislative Council in Queens County, 2nd District. He was again unsuccessful there in the general election of 1874. In that year he was named a member and secretary of the provincial Board of Railway Appraisers, a position he held until 1876, when he resigned to contest, in vain, a seat for 3rd Queens in the House of Assembly. He was one of only a handful of Protestant Conservatives who refused to support the coalition headed by Louis Henry Davies* and opposed its intention to end sectarian instruction in the public schools. 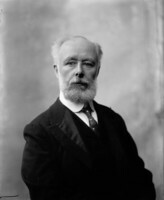 Ferguson was first elected, by acclamation, to the assembly in a by-election in 3rd Kings in June 1878, and he was returned there in the general election of 1879. In the elections of 1882, 1886, and 1890, he would successfully contest his home district, 3rd Queens. 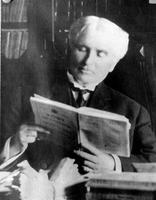 On 11 March 1879 Premier William Wilfred Sullivan* named him to the Executive Council as commissioner of public works. On 3 March 1880 he became provincial secretary, treasurer, and commissioner of crown lands, positions he held until his resignation in October 1890. During his 12 years in provincial politics Ferguson established himself as a dominant force in public life, so much so that the Daily Patriot, the chief Liberal newspaper, often referred derisively to the “Sullivan-Ferguson” government. At a time when the cabinet normally consisted of the premier and eight ministers, only two of whom held portfolios, he was clearly the most powerful minister. As treasurer he presided over the difficult adjustment to the new fiscal regime brought about by confederation. He boasted that in 1881 the province produced its first surplus since confederation; the next year he repealed the hated land tax which had been introduced in 1877 by the Davies coalition to pay for its new school system. 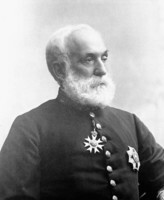 His duties as commissioner of crown lands made him responsible for the administration of the Land Purchase Act of 1875, a sometimes controversial task. As provincial secretary he handled much of the routine administration of government. And his responsibility for the stock farm made him the nearest thing to a minister of agriculture that the Island had. In many ways Ferguson was Sullivan’s right-hand man. When the province, frustrated by Ottawa’s failure to provide efficient communication with the mainland, appealed in 1886 to the British government, Ferguson was the only minister to accompany Sullivan to London, and he regularly travelled with Sullivan and later with Premier Neil McLeod* on similar missions to Ottawa. The delegates’ advocacy, in London and Ottawa, of a metallic subway across the Northumberland Strait made the project a major issue for 20 years. Ferguson was one of the best debaters in the assembly. An energetic defender of the National Policy, he often clashed with Donald Farquharson, a prominent Liberal and ardent free trader, maintaining that unrestricted reciprocity or commercial union with the United States meant “political as well as commercial slavery.” He took a major part as well in the debate over the abolition of the Legislative Council, which he strongly favoured. As treasurer, he was of course interested in the financial savings of a single-chamber legislature, but he also argued that nearly all provinces had abolished their second chambers and broadened the franchise without endangering the rights of property. Ferguson in fact harboured federal ambitions. He resigned twice from the provincial government, in 1887 and late in 1890, to contest, unsuccessfully, the federal constituency of Queens. 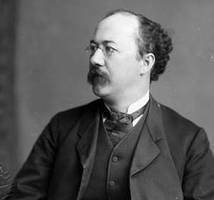 Following his defeat and that of the Conservative administration in March 1891, he wrote Macdonald that he was “discouraged,” and requested that he be considered for the vacant Island seat in the Senate. He was called to the upper house on 4 Sept. 1893. In Ottawa Ferguson’s political stature continued to grow. 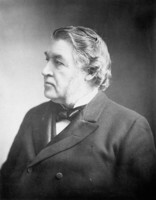 He became a minister without portfolio in January 1895 in the government of Sir Mackenzie Bowell* and he would stay in cabinet until the resignation of Sir Charles Tupper*’s government in July 1896. At the time of the “nest of traitors” incident in January 1896 [see John Fisher Wood*], he remained loyal to Bowell and became acting minister of agriculture, but he declined Bowell’s invitation to accept a portfolio in a reconstructed government. As he wrote on 16 January, he “refused to do so unless the resigned members were allowed an opportunity of coming back.” Though he recognized the advantages of a portfolio to the Island, “the ostracism of the resigned Ministers, or any of them, would have led to the disorganization of the Party” and “closed the way” to Tupper’s coming into the government, “which I regard as the salvation of the Party.” Ferguson was, however, named to the Senate’s powerful standing committee on banking and commerce in 1896 and in the session of that year, before Tupper’s resignation, he was a deputy Senate leader under Bowell. After the defeat of the Tupper government in the election of 1896, Ferguson continued to be a leading spokesman for his party in the Senate on many national issues. As the Montreal Daily Star would observe in 1902, he was immensely knowledgeable and was “possessed of an enormous capacity for work”; his speeches on Canada’s foreign trade, for instance, reveal a marvellous command of information. 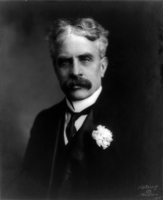 On this subject, Ferguson – later a vice-president of the British Empire League in Canada – said in the Senate in 1898 that he would gladly increase trade with the empire and promote a closer association with it, if either was possible. In a major debate in 1906 on Senate reform, Ferguson showed characteristic originality and thoughtfulness. He opposed abolition because the Senate’s essential function was the protection of the smaller provinces. Its weakness was that members were appointed by the federal administration of the day; as governments were tending to remain in power longer, the business of the Senate inclined to be dominated by political majorities and thus its usefulness was diminished. He recommended, in a move which may have startled many, that senators be appointed by both political parties in numbers proportionate to their representation in the House of Commons, and that the universities of the country be allowed to nominate members. In all his activities, Ferguson displayed a generous mind. Although, in the opinion of E. J. Hodgson, he was “some kind of Baptist” who would not receive political associates on Sundays, his religious tolerance in an age of intolerance had been demonstrated by his courageous stand on the school question in the provincial election of 1876. Similarly, though he had held office in the British American Order of Good Templars in the 1860s and once boasted that he “never drank a glass of ardent spirits,” he was not a prohibitionist. He believed that federal licensing legislation – the Canada Temperance Act of 1878 – should be given a “fair trial.” Where regulation under the federal law was rejected by local plebiscite, he supported provincial legislation rather than total prohibition. A man of considerable ambition, Ferguson suffered a major disappointment in 1906. 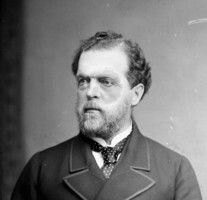 In that year Bowell resigned as leader of the opposition in the Senate and a mail vote was taken to choose between Ferguson and James Alexander Lougheed* of Calgary as his successor. Lougheed won handily, leaving Ferguson somewhat bitter. According to Sir Robert Laird Borden*’s memoirs, Ferguson had expected to win and believed he had been deceived; he especially blamed Bowell. Perhaps Bowell had not forgotten Ferguson’s refusal to accept a portfolio in 1896. Borden records that Ferguson never spoke to Bowell again. Whatever transpired, the incident was evidence of Ferguson’s prominence in national politics. St Columba Presbyterian Church cemetery (Marshfield, P.E.I. ), Tombstone inscription. NA, MG 26, A; RG 31, C1, 1881, 1891, Prince Edward Island. PARO, Acc. 2453; Acc. 2654; RG 5, minutes, 16 Feb. 1872, 11 June 1874, 3 Oct. 1890; RG 16, land registry records, conveyance reg., liber 40: f.118; liber 76: f.973; liber 93: f.110; liber 131: f.138. P.E.I. Museum, Geneal. Div. files. St Paul’s Anglican Church (Charlottetown), Reg. of baptisms, book 2: 145. Examiner (Charlottetown), 1864–80, continued as the Daily Examiner, 1881–1909, esp. 4 Sept. 1909. Islander, 1864–69, 10 Feb. 1871, 4 April 1873. Patriot (Charlottetown), 1864–69, 23 Aug. 1873, 24 Oct. 1874, 31 Aug. 1876, 3 April 1879, and its successor the Daily Patriot, 17 April 1882, January 1890, 8 Nov. 1902, 4 Sept. 1909. R. L. Borden, Robert Laird Borden: his memoirs, ed. Henry Borden (2v., Toronto, 1938), 1. Can., Senate, Debates, 1893–1909; Journals, 1893–1909. Canadian annual rev. (Hopkins), 1901–9. Canadian biog. dict. Canadian directory of parl. (Johnson). Canadian men and women of the time (Morgan; 1898). CPG, 1893–1909. Cyclopædia of Canadian biog. (Rose and Charlesworth), vol.2. History of Marshfield (Marshfield, 1972; copy in the P.E.I. Coll., Univ. of P.E.I. Library, Charlottetown). Illustrated historical atlas of the province of Prince Edward Island . . . ([Toronto], 1880; repr. Belleville, Ont., 1972). P.E.I., House of Assembly, Debates and proc., 1873–93; Journal, 1873–93; Legislative Council, Journal, 1873–93. Standard dict. of Canadian biog. (Roberts and Tunnell), vol.1. 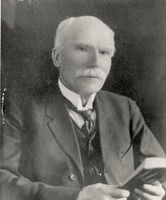 Frederick L. Driscoll, “FERGUSON, DONALD,” in Dictionary of Canadian Biography, vol. 13, University of Toronto/Université Laval, 2003–, accessed April 21, 2019, http://www.biographi.ca/en/bio/ferguson_donald_13E.html.